When many people think of Arizona, they think of cowboys, sand dunes, heat, and cacti, but it may come as a surprise that Arizona actually has quite a varied topography—with the highest elevation at 12,633 feet above sea level (Humprehys Peak northwest of Flagstaff) and the lowest at 70 feet above sea level (Colorado River south of Yuma). In fact, you can find a low desert climate in Phoenix and Yuma, a mid-desert in Tucson and Wickenburg; a high desert in Prescott, Payson, Bisbee, and Sedona; plateau highlands in Williams, Page, and Holbrook; and cold mountainous regions in Flagstaff and Greer. As a result, the weather and climate in Arizona can be rather unpredictable depending on where in the state you go. Typically, the heaviest rain falls during the summer thunderstorm (monsoon) season. During this period, rain can accumulate very quickly, resulting in flooded streets or washes, and can even cause deaths via flash flooding. In 1911, Phoenix had 4.98 inches in 24 hours between July 1 to 2, while 11.4 inches fell on Workman Creek (near Globe) on September 4 to 5, 1970. Single-day downpours are not unheard of, either: Phoenix endured 3.29 inches of rain on September 8, 2014, so some years Arizona sees extreme rainfall in short periods of time. Most of the severe weather seen in Arizona, especially in the Phoenix metro area, is caused by microbursts, which happen when a small area of air rapidly descends beneath a thunderstorm. When the descending air hits the ground, it quickly spreads out in all directions, causing very strong, straight-line winds. These winds are commonly as strong as 40 to 60 miles per hour but can exceed 100 at times. Microbursts occur over a rather small space-scale, and typically the area affected is less than 2.5 miles in diameter. 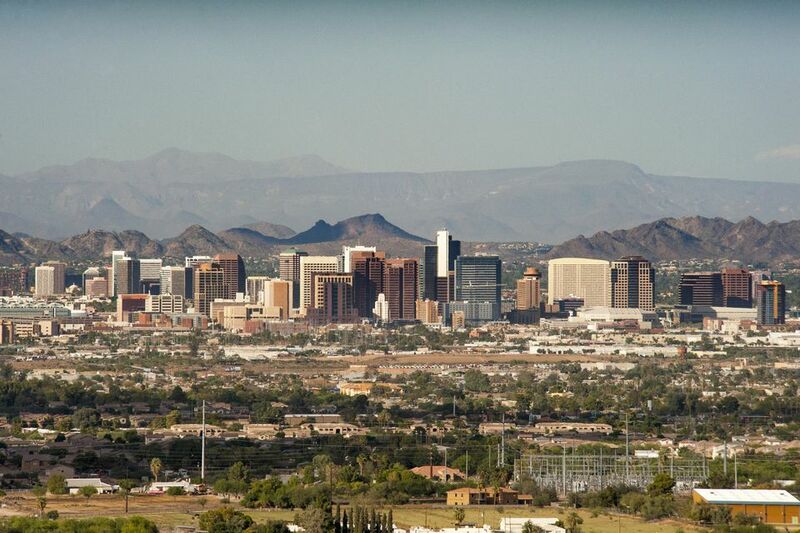 Phoenix: Although it experiences five months of brutal summer heat from May through September, Phoenix cools down in the winter to the low 60s and 70s, making it a great time to vacation from the frigid northeastern United States. The rainiest months are January through March and July to August, but outside of extremes, the city rarely receives more than an inch of rain in a 30-day period. Flagstaff: A popular destination for ski vacations, Flagstaff is located at 7,000 feet above sea level in northern Arizona (just southwest of the Grand Canyon) along Historic Route 66. Due to its high elevation, the city experiences colder temperatures year-round and is often covered in snow throughout the winter season. Still, temperatures top out at an average high of 82 degrees Fahrenheit in July and typically average above 40 degrees throughout the winter, but low averages can dip down to 17 degrees Fahrenheit in December and January. Tuscon: Just a couple hours south of Phoenix, Arizona's second-largest city is a bit higher in elevation than Phoenix and generally a few degrees cooler. Average highs range between 100 degrees Fahrenheit in June and July and 66 in December and January, while average lows range between 41 degrees Fahrenheit in the winter and 76 in the summer. Sedona: This popular destination's unique red rock formations attract thousands of visitors from all around the world each year, some looking to find a certain spiritual connection to the land. Unlike much of Arizona, Sedona does experience snowfall in the winter and relatively milder summers, making it a great destination year-round. However, March and October are the busiest months of the year and winter is the least crowded. High temperatures in Sedona range from an average of 96 degrees Fahrenheit in July to an average of 57 in December, while low temperatures range from an average of 66 degrees Fahrenheit in July to 32 in December. Even cities in Arizona with the highest elevations experience brutal heat all summer long, but that doesn't stop locals and tourists alike from enjoying the plethora of events and activities only offered this festive time of year. Flagstaff and Sedona may offer you a bit of respite from the heat, but you'll find more music events in Phoenix and Tucson. No matter where you go, though, you should expect average high temperatures between the 90 and 100 degrees Fahrenheit. Extremes do happen, of course. Phoenix residents have felt the Arizona heat many a summer afternoon, including a scorching 122 degrees Fahrenheit on June 26, 1990, while popular vacation destination Lake Havasu City regularly tops the state's hottest list, including a 128-degree Fahrenheit afternoon on June 29, 1994. What to Pack: Because of the heat, you'll want to wear as little or light of clothing as possible, so pack plenty of breathable fabrics, T-shirts, and shorts. You'll also want to bring sunglasses, sunscreen, and perhaps even an umbrella if you're especially prone to sunburns, and don't forget to bring a bathing suit if you want to cool down in the water. Camping and hiking gear are also essential if you want to enjoy the great outdoors when the snow's finally melted off the mountain peaks. Because the intense heat of Arizona's summers often starts in the spring and doesn't cool off until well into fall, the state only experiences weather typical of these seasons for a short while between summer and winter. However, March, April, October, and November are also the least busy months for tourism, which makes spring and fall the perfect time to snag some off-season deals on accommodations and transit. Also, since the weather is slightly cooler, you're more likely to enjoy the outdoors; however, these months are also often the rainiest, especially in Flagstaff and Sedona. What to Pack: You still won't really need a sweater in the fall or spring, but you might want to pack a long-sleeved T-shirt just in case a rainy day makes it a little too chilly out. Remember to bring an umbrella and a raincoat in case of a sudden spring or fall shower. You can also still swim and take part in many outdoor activities this time of year, so don't forget to pack your swimsuit, and your camping gear if you plan to stay overnight in the mountains. While some high-elevation cities like Flagstaff are covered in snow most of the winter, other colder locales like Sedona may also get snowfall, but it rarely sticks. Still, temperatures across the state drop considerably (sometimes over 60 degrees Fahrenheit) from the summer highs, meaning you'll need to prepare for colder weather if you head out to the desert this time of year. However, warm days still abound in Phoenix and other low-elevation desert cities, so you can still escape the winter chill by vacationing there in January and February. Hawley Lake is known for its record cold temperatures in the past, including 40 below zero on January 7, 1971. Even Phoenix gets into the season once in a while, including a 16 degree Fahrenheit evening on January 7, 1913, though the city's official rarely gets below freezing. What to Pack: Layers are the key to staying comfortable in the Arizona winter as temperatures can fluctuate from 70 degrees Fahrenheit in the daytime to 40 degrees Fahrenheit overnight (or colder in cities like Flagstaff). You'll want to bring a variety of pants, shirts, sweaters, and hoodies, and you may want to pack a pair of shorts and even a winter coat depending on where you go. If you plan on hitting the slopes on one of Arizona's mountains, don't forget to pack your snow gear.